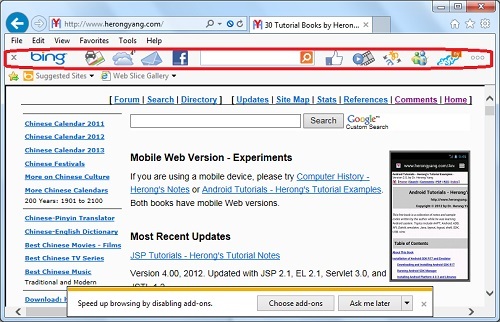 ∟Disabling IE Addon "Bing Toolbar"
This section provides a tutorial example on how to disable 'Bing Toolbar' in IE (Internet Explorer). "Bing Toolbar" seems to be a nice IE addon. It gives you quick access to: News, Maps, Weather, Hotmail, Facebook, Skype, and other Web tools. However, "Bing Toolbar" does take away space from your browser window to make a "bar" to displays icons for you to invoke its functions. It is also consuming CPU and memory of your computer. 2. Locate and click "Bing Toolbar" in the addon list. Then click the "Disable" button. You see the "Disable add-on" dialog box showing. 3. Make sure "Bing Toolbar Helper" is checked in the "Related add-ons that will also be disabled" list. Then click the "Disable" button in the dialog box to confirm. 4. Close the "Manage Add-ons" dialog box and restart IE. You see IE showing up without Bing Toolbar. ►Disabling IE Addon "Bing Toolbar"